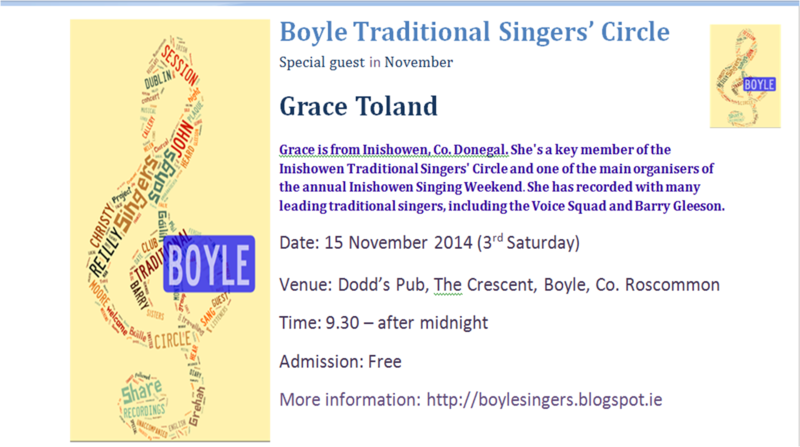 Grace Toland will be the guest at the Boyle Traditional Singers' Circle's regular 3rd Saturday session, on Saturday, 15 November, 9.30, in Dodd's Crescent Bar, The Crescent, Boyle, Co. Roscommon. Grace, from Inishowen, Co. Donegal, is one of the main organisers of the popular, annual, Inishowen International Folk Song & Ballad Seminar. 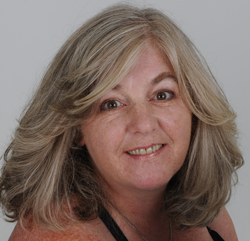 Grace has recorded with many leading traditional singers, including Barry Gleeson and the Voice Squad. 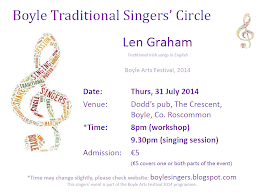 The Boyle Traditional Singers' Circle meet the third Saturday of every month in Dodd's Crescent Pub, The Crescent, Boyle, Co. Roscommon, 9.30pm, Admission, free. 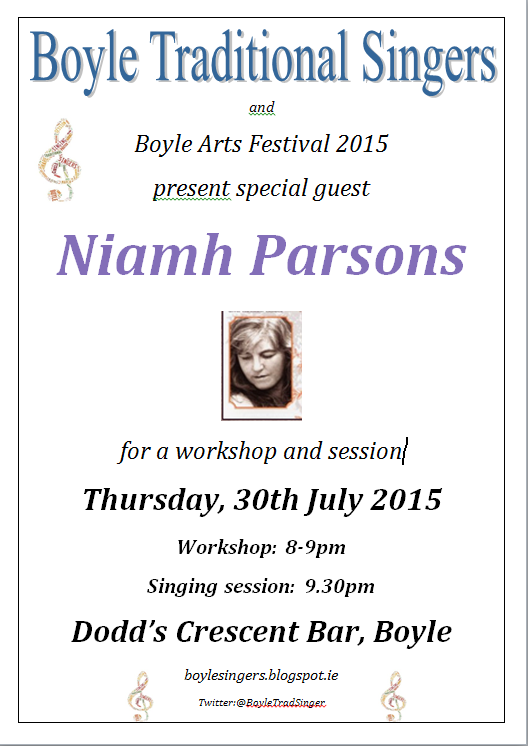 We had an extra singing session: THURSDAY, 31 July 2014: Annual Boyle Arts Week singing session. 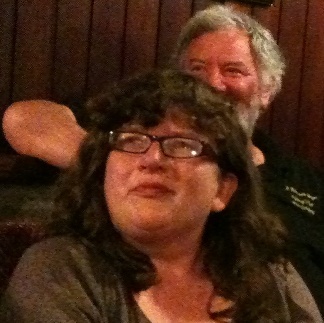 Twenty singers gathered in the back of Dodd's the other night, a couple of reciters and the always-welcome listeners. We had two visitors from England, who came to Boyle especially for the Traditional Singers session - Alan and Síle - both lovely singers. Alan sang a great version of the Kerry Hills and Frank followed shortly after with Ewan McColl's eulogy to the mountains: the Joy of Living and Tony soon followed up with the Boys of Barr na Sráide. 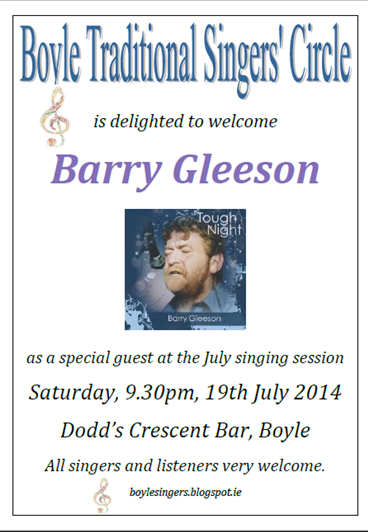 In the YouTube clip linked to below, Christy Moore sings that song, and Christy is to be heard soon in Boyle. 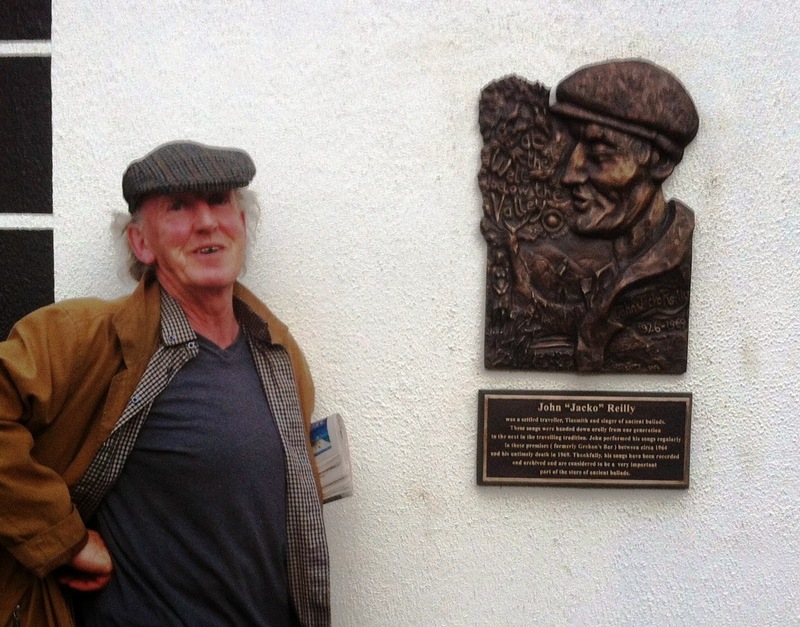 He'll be giving a concert, along with the Grehan sisters, on June 26th: a tribute concert to the traditional singer, John Reilly, who died in 1969. 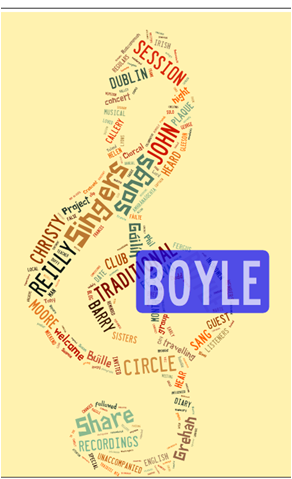 Christy Moore and many other singers owe significant songs in their repertoire to John Reilly. The other night was a night for songs of emigration too, from Breege, Naas, Billy and Clíona, who sang the Rambling Irishman, reminded of it by the excellent documentary which was screened during the week on Dolores Keane and also by the fact that it's on the new Voice Squad (Phil Callery, Gerry Cullen, Fran McPhail) album. The reciters were Frances and Padraig McGinn. Frances had poems by a local man, Seamus Kelly about the coming of electrification to the countryside and the Bord na Móna village at Lanesborough. We had the dán macaronic from Mr McGinn, Micheál Mór. Jim Bainbridge sang a song 'in his own language' as he put it - something about the main character's wife being an 'amazer' for the amount of booze she managed to swallow! You'll have to ask Jim for the words - we got the sense but not the full script! George left Old Skibbereen and Tony went to London so fair, while Sean sang the Town I loved so Well and Marie had Andy M Stewart's Two Orphans. Joe Corscadden was away shopping in AldiliddleAldi but had time for politics with Joe Frawley, the Councillor. There were better notes than usual as the regular beer mat scribblings were supplemented by notes taken on proper paper. Now there's an innovation. Thanks Frances.